1905 postcard suggesting a uniform change. From small beginnings, the use of the silver fern in company branding in New Zealand has recently exploded. 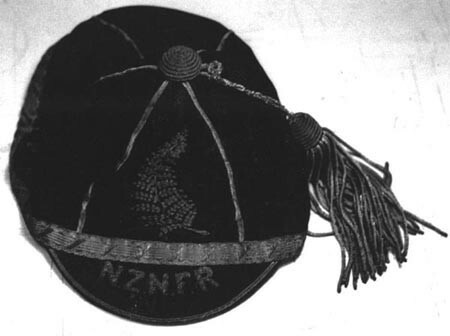 In 1991 it got to the point that the NZRFU attempted to stop it with a trademark, but failed. The fern is out of the bag and belongs to everyone. It’s been overexposed like any national icon. It’s gotten to the point that the silver fern is a serious contender for a new national flag, one that differentiates it more from the Australian flag, which is the same flag with an extra star. With the extraordinary powers of modern web search, it’s easy to find out more than the official histories have been able to dredge up. Once again, history has been simplified into something a little too neat and tidy. In 1925, a controversy— erupted in the New Zealand media about the origins of the silver fern. Other sporting codes were wanting to use the silver fern. People were still alive who had been on the 1888 rugby tour so it wasn’t too hard for the Evening Post to find an opinion or two. Apparently— the silver fern was picked up almost by accident on a trip to the Wairarapa in the late 1880s. These remarks were verified by another member of the squad. But when the Native team arrived in England in late 1888, the Evening Post’s correspondent wasn’t very taken with— the new uniform. 40 years later the press still found it— a little sombre, but functional at least. While their dark uniform was raising eyebrows in 1888, Ellison was picking up— on many game tactics that would later inform his book. I think the rugby-playing genes were completely used up on Ellison. I am quite incapable of playing it. That honour goes to Ellison’s great great grandnephews, Tamati and Jacob Ellison – both recent or current All Blacks and doing a fine job of it. After a brief but remarkable career in rugby, law, and politics, Thomas Ellison died— in 1904 at the age of 37. Ellison’s body was intercepted at the Porirua train station and taken for burial at his iwi’s marae at Otakou— , Otago. Within a month of his death, the Public Trustee was advertising the sale of his newly-built house in Day’s Bay. Construction finished after he was hospitalised. 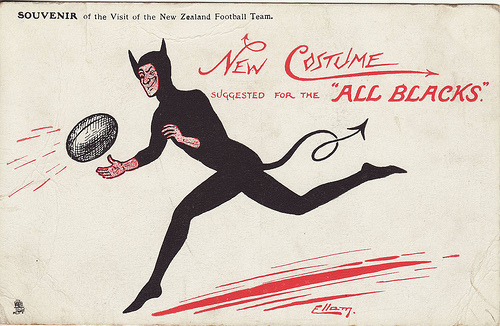 A year later the British press christened— the visiting NZ team the “All Blacks”. Skipping forward a century to 2005, Ellison’s suggestion for a haka, Chief Te Rauparaha’s “Ka Mate” was replaced with “Ponga Ra”, meaning “Silver Fern”.